We are so familiar with the fact of unemployment that we tend to dismiss the notion that it could be eliminated. But that idea – embodied in a recent proposal for a jobs guarantee – is making a comeback. A couple of weeks ago, the CAP (Centre for American Progress), a US think tank with links to the Democratic Party, outlined a proposal for a “Marshall Plan for America”, with its central pillar being a new jobs guarantee for those who don’t attend college. Their analysis is that the election of Donald Trump was caused by the increasingly desperate situation of non-college educated white Americans, many of whom are either unemployed or in poorly-paid work. Over time, the pay of unskilled Americans has simply not increased in the way it has for other groups (See Chart). And the participation rate, particularly of men and non-graduates, has fallen as people have stopped looking for work (See Chart). Their solution is a “new, large scale programme of public employment and infrastructure investment”, with a job-guarantee for non-college graduates paying a living wage of $15 an hour plus taxes and social security contributions. It would also include publicly-funded training to prepare workers for private sector jobs. The aim would to achieve and maintain the employment rate of prime-age workers at the 2000 level of 79%. The authors estimate the cost of such a programme at $158bn per annum, compared with the Trump’s proposed tax cut worth $600bn. Traditional economic theory – based on the long-run Phillips Curve – suggests that a degree of unemployment is necessary in an economy to prevent inflation from accelerating. But, advocates of the job guarantee argue that inflation can be kept stable even if the unemployed are put to work, provided it is outside the ordinary labour market. Furthermore, such a programme would raise the incomes of the poor, boost demand, and ensure useful tasks, left unfulfilled by the market, from caring for the elderly to tidying public parks, could be filled. Versions of jobs guarantee programmes tried in the past include the Civilian Conservation Corps, part of the New Deal in the 1930s and more recently, the Jefes de Hogar (Head of Households) program introduced in Argentina in 2001. In other words, a jobs guarantee could be an effective bulwark against the forces of globalisation and technology which have tended to transfer economic power from workers to employers. He also suggests it would help shorten the duration of recessions, by ensuring that income and employment are protected during downturns. Others think the whole idea is fundamentally misconceived. Over at the Mises Institute, a free market think tank, they argue that employment is a means rather than an end. And if that employment is worthless then it would be a cost rather than a benefit to society. Finally, Bill Mitchell, Professor of Economics at the University of Newcastle, NSW, Australia, and one of the academic architects of the job guarantee idea, is frustrated by the superficial nature of the debate thus far. He says that there is now a substantial academic literature on the subject which has addressed many of the objections. But much depends on how it is implemented. If the jobs created meet some carefully designed criteria (including that the they are non-rival to private sector and public employment) then it should meet both the objections of Bruenig and Ozimek above. In a sense, the job guarantee idea is a curious proposal at a time when unemployment is at a historic low. 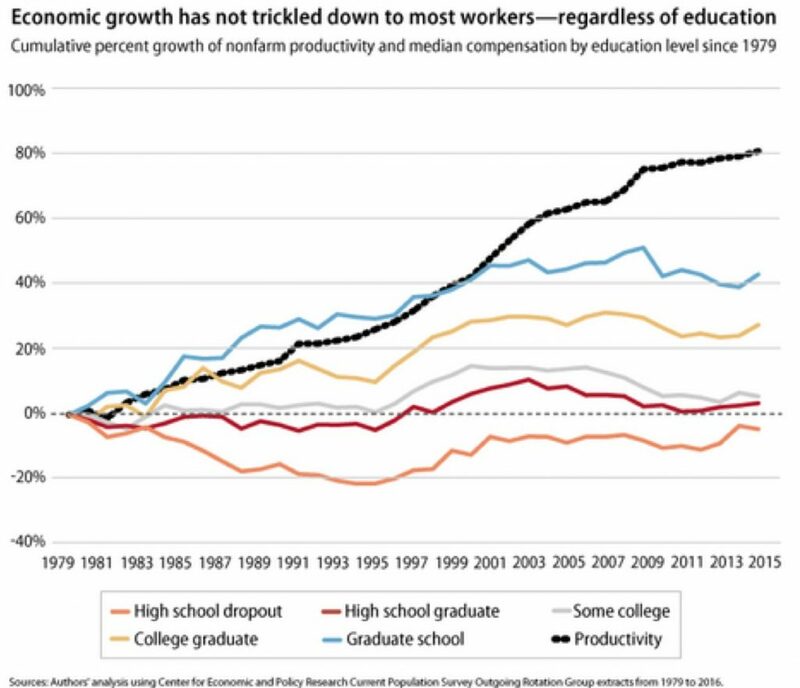 Those without a college degree have suffered in recent years. But their problem is not a lack of employment (as it was during the 1930s). Rather, the economic failure behind Trump’s rise seems to have been a lack of meaningful employment that generates sustained rises in living standards over time. A job guarantee scheme that simply provided stop-gap employment in low-skill sectors would therefore not achieve much. The case for such a program in the US rests not just on whether it can provide jobs, but jobs with prospects, in the areas where economic blight has been most serious. The CAP proposal is a start, but more work is needed on the details to create a program that achieves this objective.